The Elder Scrolls V: Skyrim is one of the great RPGs of our time, although with a few years already behind him, he is still reaping awards and successes in each of its editions. And now, to top it off, we can enjoy a true open world experience in virtual reality. We will be able to enter into adventures, landscapes, forests and a captivating story in a unique format and using virtual reality devices. 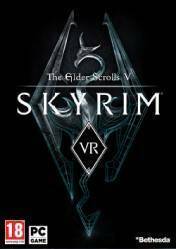 Skyrim VR will give us more depth and immersion, whether it's during combat, especially epic dragon fighting, or exploring the rugged mountains, thick forests or deep caverns. This edition also includes the official Dawnguard, Hearthfire and Dragonborn DLCs. Don't forget to check the Virtual Reality section of Steam for devices compatible with this title. This Title is the love of my life. It's like the definition of RPG's (of course after Diablo 2 :-) ). Story, enviorment, characters, powers, AI... it's all a blend of good gaming and great fantasy. Play it if you call yourself a gamer. This game is really awesome, because There are lots of quest which I ama not sure is there a possibility to finish all of them. And also you are not going to get bored there are wide range of interesting things in this game. Skyrim is already one of the best games but now being almost in it is awesome. you can use the fire spell and aim wherever you like. It's so baddass and fun! you can easily lose hours and hours with the original game, I really wonder how this one can improve that! anyway I'd really like to play it!